"Picture books are a true popular art form: for all that freedom to experiment, there's also an obligation to entertain, to capture a kid's attention. If we fail, if we're boring, that kid may not take a gamble on literary fiction again." (Book Riot). I read this quote by Mac Barnett and gasped at its gravity. I reread the quote a dozen more times and wrote it down so I wouldn't forget it. Then, I moved on to read Barnett's acceptance speech he gave when he accepted the 2012 Boston Globe-Horn Book Picture Book Award along with illustrator Jon Klassen for the book, Extra Yarn. At the end of his speech he said, "I'm bullish about the future of the picture book. I love good picture books with strange stories, shaggy stories, books full of mysteries and surprises. These books are still being written. But they need to be read, and loved, and faced out on a bookshelf so you can see their beautiful covers." (The Horn Book). I set aside his speech and saw the first quote again. 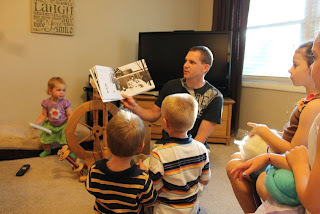 This time I saw it from a different perspective, my perspective as a parent who believes reading picture books with my children is one of my most important duties. My mind changed the beginning of the quote to read, "Reading picture books with your children is a true popular art form: for all that freedom to experiment, there's also an obligation to entertain, to capture a kid's attention. If we fail, if we're boring, that kid may not take a gamble on literary fiction again." I once again gasped at its gravity. 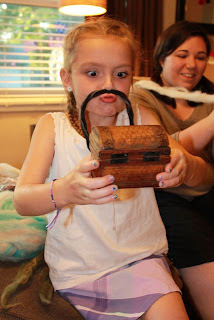 I thought about a choice I made so long ago when my first daughter was around the age of one. 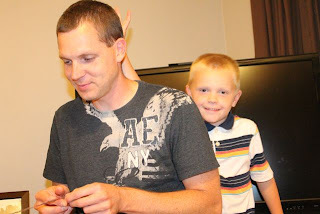 I decided that I was going to do everything I could to instill a love of reading in my children. Since then, daily we read a wide variety of books. I entertain them with funny voices as I read, and invent fun activities to extend our favorite ones, all with the hopes of capturing their attention. My reason for saying all of this is not to toot my own horn, but as a personal reflection. 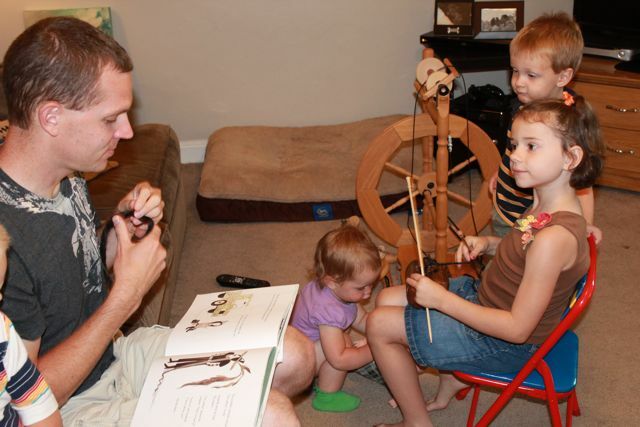 What if I hadn't taken the responsibility of reading with my children? What if I would have failed? It is scary for me to think about. Books have brought so much to our family. I can't be more thankful (and lucky) that I decided to make a commitment to reading to my children. After I wrote the last paragraph I looked at the quote once again and this time I saw a different ending, "If we succeed, if we're entertaining, that kid will learn to love reading." Mac Barnett is succeeding. He has published 13 books for children including four Brixton Brothers middle grade novels. His other nine books are picture books including the 2012 Caldecott Honor book Extra Yarn (illustrated by Jon Klassen), Billy Twitters and his Blue Whale Problem (illustrated by Adam Rex), and one of our favorite books of all-time Guess Again? (illustrated by Adam Rex). About three weeks ago I attended Ohio State Fair in Columbus, Ohio with my family and wife's parents. We were walking through a building full of hundreds of sheep that would be competing in the annual sheep show. Some sheep were resting, some were being groomed, some were walking around with their caretakers, but almost all of them were making lots of noise! 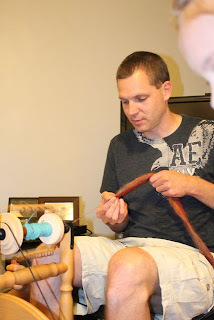 I said to my wife when we saw two women spinning wool into yarn, "Spinning yarn would be fun to do with the kids. I feel like there is a book coming up that it would be perfect for." About 15 minutes later I said, "Mac Barnett's birthday is August 23 and he wrote Extra Yarn. That's it. We have to find a spinning wheel." 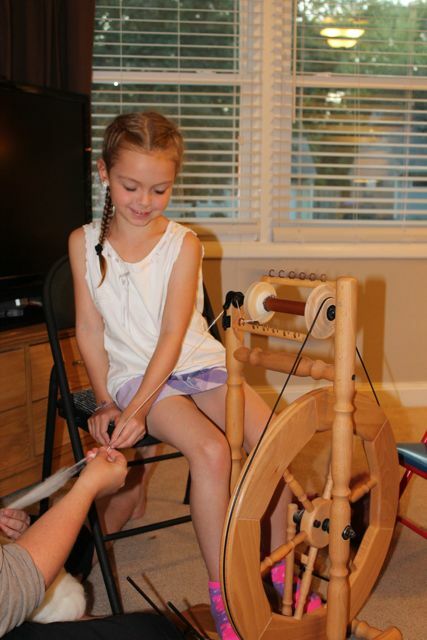 My mother-in-law overheard my enthusiasm and said that my sister-in-law might have a spinning wheel for us to use. 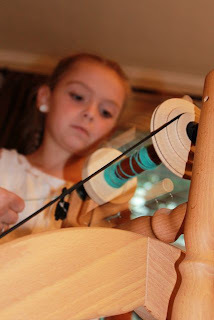 Not only did she have a spinning wheel, wool, drop spindles, and lots of yarn, but she invited us all over to their house to give us a lesson on spinning!! 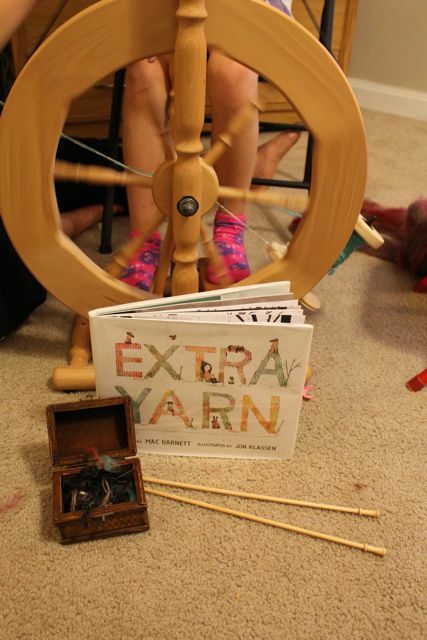 We started the evening by reading Extra Yarn by Mac Barnett and Jon Klassen! 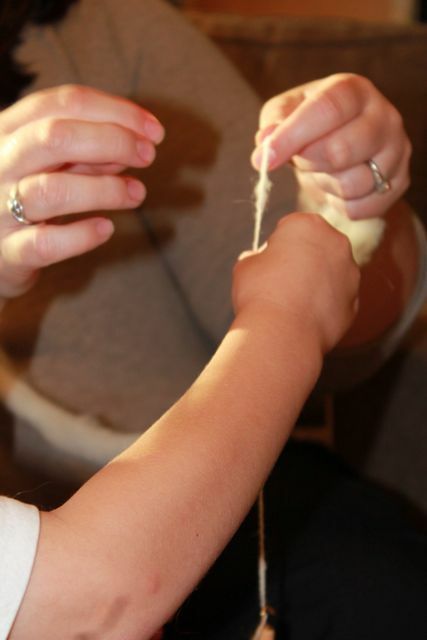 She showed us wool from many different animals including sheep and alpacas. My kids were able to feel the difference between the two types of wool; sheep's wool was coarser and alpaca's wool was really soft. With his yarn in hand, he checked out the foot pedals on the spinning wheel. She gave her nephew a lesson using a drop spindle to spin the wool into yarn. 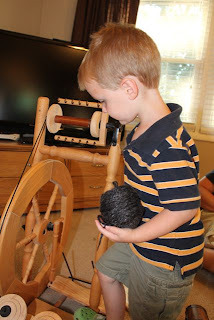 He loved spinning it! In Extra Yarn, Annabelle finds a box filled with yarn of every color. Annabelle knits sweaters for many people, but still has extra yarn. I brought along a box and we started to fill it with the yarn that we spun. Near the end of the book an archduke appears and attempts to buy the "miraculous" box of yarn. 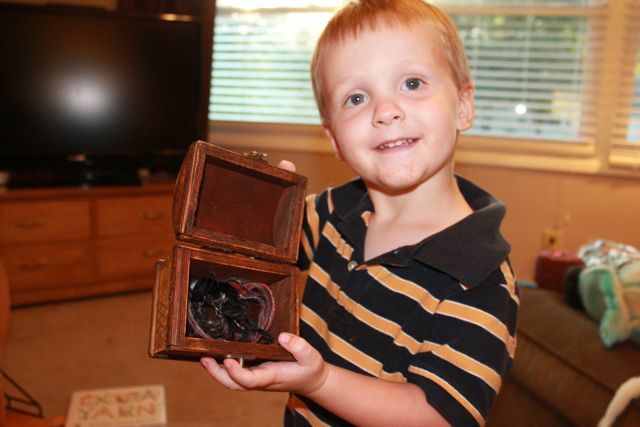 When Annabelle refuses to sell he decides to take a more forceful approach. 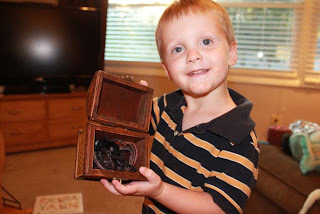 We found a black piece of wool that looked just like the archduke's mustache. My daughter did a great job acting as the archduke. Earlier in the day my daughter preformed in her first community play. She was definitely still in feeling energetic enough to give us another performance. 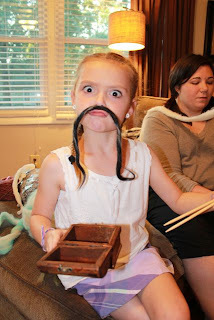 My niece loved having the box of yarn, knitting needles, and the mustache. She requested that we perform the part of the book with the archduke. I got to be the archduke and she was Annabelle. Bringing the book to life was fantastic. 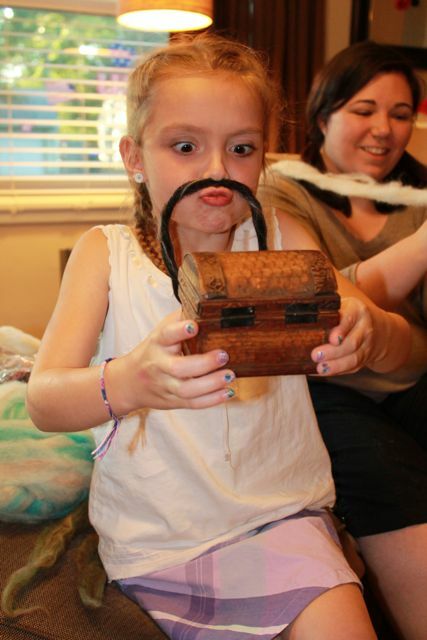 My niece remembered the lines from the story and helped everyone get into character. 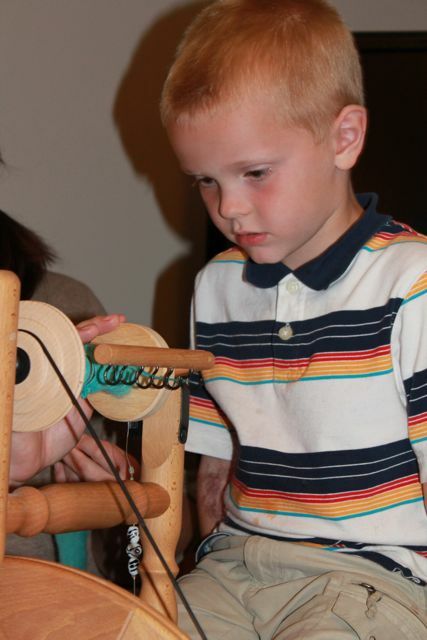 Next, everyone had a chance to try the spinning wheel. We chose to spin a teal color wool. I was impressed with his determination. She really got the hang of it after some practice. I tried too, but I didn't have much success. My sister-in-law sent the spinning wheel home with me to practice. 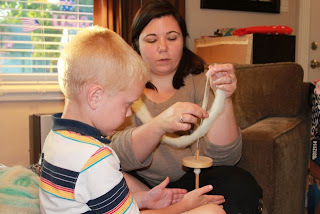 I am still amazed that an idea that happened in the middle of a building full of hundreds of sheep culminated with my whole family learning to spin their own yarn. 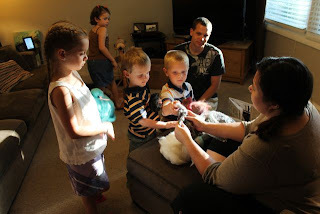 Thank you so much to my sister-in-law for being such a patient teacher. We really enjoyed the experience and learned so much! Thank you to Mac Barnett for making entertaining books that capture my family's attention!